“These photos started out as interiors in a bookstore/living space as you may have seen some of the non book related images. I'm going to trim the non-book photos off perhaps put in a separate web gallery, they just aren't cohesive enough as the book photos became the focal point. 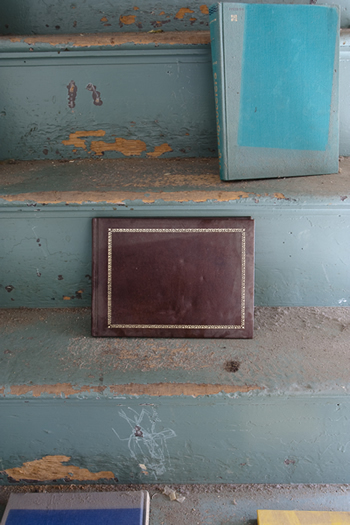 I started out with some photos of books in the space that were more "found". Then I started to move them around, and once that happened I figured I was doing still lives. I felt I was coming to that point and thought "oh crap, I'm going to have to control everything" so they've stayed on the more elementary side of things trying not to juggle too many balls but looking closely at these things as forms, in relation to the structural space around them. Connecting the book to the structure made the concept of Ideas and books and architectural elements(structure) or thoughts that much stronger. So I've been building on the "forms" of books, resisting whenever possible to let the content of the book actually dictate the idea of the picture. The hard thing is to not let the title or some obvious aspect of the book dominate a space that may have no relation to it, the main proving ground is in perception first, the concept comes later. The titles come about by using a book that may have been a focal point to start out with or in some cases what remained the main interest in the image. 1998 BFA Photography, Massachusetts College of Art, Boston, MA.